This is something I predicted long ago and now, here we are. Those tunnels are deep enough to be just about impenetrable by bombs. West is right about voting on the JCPOA, at this point, what difference does it make? The Iranians are working diligently with the Russians, Cubans and Chinese in Syria on the war front there. When they are done in Syria, their attention will go towards the rest of the Middle East and Europe. This is only the beginning. Iran and Russia are feverishly buying up all the oil and gas reserves out there. They need them for war and for leverage. Now, they are showing off their military prowess. Obama has neutered the US military so badly that there is nothing we can do at this point and our enemies know it. Behold a small glimpse of the might of one arm of the new Axis of Evil... Iran. Funded by... Barack Obama. We reported yesterday how the Iranian parliament voted on its own amended version of the Joint Comprehensive Plan of Action (JCPOA), the Iranian nuclear deal. At this point I just have to say, “what difference at this point does it make?” The whole episode is nothing more than a fiasco. One thing I have to give the Iranians credit for — at least they actually voted on the JCPOA. President Obama strong-armed 42 Senate Democrats to block the resolution of disapproval from even coming to the Senate floor — funny, who has a democratic process working? Right now I don’t think the JCPOA has any meaning whatsoever. The Iranians have violated it with ballistic missile testing. Their Quds Force commander has been traveling all over the place — dude has serious frequent flyer miles. We reported here about the European countries and businesses opening up new markets, and England has reopened its embassy. And the Iranians realize they no longer need to live the lie and facade. 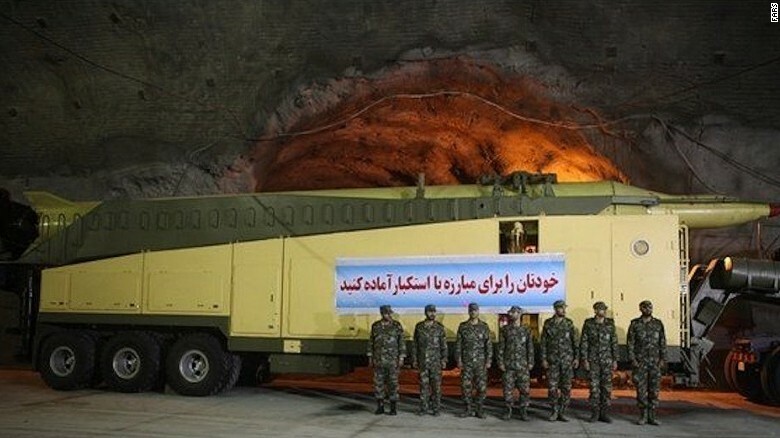 As reported by Arutz Sheva (Israel National News), “Iran’s Revolutionary Guard opened the doors of a secret underground missile base to state TV, showing off medium- and long-range missiles, The Associated Press (AP) reported Wednesday. The station aired footage of long tunnels with ready-to-fire missiles on the back of trucks, according to AP. The broadcast said the facility is one of hundreds of underground missile bases around the country. It didn’t disclose the location but said it was 500 meters (1,600 feet) underground. Amir Ali Hajizadeh, head of the Revolutionary Guard’s aerospace branch, boasted that the facility is the “tip of the iceberg” of the Guard’s military might, according to AP. 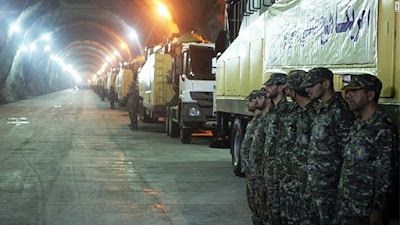 The broadcast appeared aimed at showing that the Guard will continue its missile program despite UN Security Council resolutions and despite Iran’s nuclear deal with the West. There you have it, why would we continue down the path of believing anything the Iranians say? Just about every day since the triumphant announcement by President Obama and Secretary of State John Kerry of the JCPOA signing Iran is demonstrating its belligerence has no boundaries. Iran’s hegemonic reach is solidifying in Yemen. Iraq has indeed disintegrated into being a client state of Iran — after the service and sacrifice of our men and women in uniform. Assad in Damascus has to feel emboldened now that the full cavalry has arrived. And Hezbollah remains the dominant power in Beirut, Lebanon. What is the end game for Iran? Regional dominance and the supremacy of Shia Islam — which will put it clearly in the bulls eye of the dominant Sunni states. My assessment is that the Obama administration has conceded to Iran and Russia, to handle the ISIS problem. Part of that concession is Assad staying in power and the sacrifice of those “Syrian rebels” who had depended on the United States. Sadly they must join a long list of folks abandoned by Barack Obama. Of course there are those of you who would say, sure, go ahead and allow them to fight this out. We don’t need to send one American into this cauldron of disaster. The true reality is that our men and women in uniform had achieved victory and beaten back the Islamic jihadists. Remarkably, our fighting forces had taken on a vicious, barbaric and savage enemy and with the right adjustments, took the fight to them and ran them into the ground. They had done the impossible and earned respect and regard in the Middle East. What is becoming the end game for America is the loss of all that was hard fought and won. There are willing allies in the region — Israel, Egypt, Jordan, the Kurds, Bahrain, and the UAE — who now don’t know what to think. Yesterday we reported that Cuba has deployed troops into Syria — after we foolishly opened up diplomatic relations with the communist country and removed them from the terrorist list. Old bedfellows have reunited – the last time for the Soviet Union and Cuba was in Angola. Now, ask yourself, where next? And I haven’t touched on China and the Pacific. If Putin goes unchallenged in the Middle East, look for him to make a move deeper into Ukraine and into the Baltic States — that is Latvia, Lithuania, and Estonia for some of you. And we now have confirmed intelligence that it was a Russian missile which shot down the Malaysian Airlines flight 17. Putin, Rouhani, Khamenei, Jinping, Lil’ Kim – they’re not that forceful but in the absence of American resolve, they will continue to push the envelope as far as they can. What is worse — and getting back to Iran’s unveiling of the underground missile bases – they’re going to embarrass the United States as much as they can for the next sixteen months. Gonna be a rough period for America, but it didn’t have to be this way. The question is, America, will we screw this up again next November? Evil is at the doorstep; another four years of this and it will be in our living room. That’s not hyperbole considering the Director of the FBI says ISIS is recruiting online 24/7 in every state in America. Obama betrayed those he allied with in Syria. He meant to do that all along. It was part of his flexibility with Russia. This underground missile bunker is said to be one of hundreds and I believe that. Obama has undone everything our brave warriors fought, bled and died for and it didn't take long. West is right again on the Baltics, which I also predicted. Syria will be used as a gateway to war in the Middle East and Europe. You are seeing World War III warming up. This isn't some remote war we can ignore... this will come here sooner than later. Right now, we are in no position to fight back. We have no leadership and a gutted military. We are also broke. This is why I admire Allen West; he sees things clearly. We must elect a true constitutional conservative to turn this around or we are going to be fighting ISIS/Iran/Russia/China in our individual neighborhoods. It's coming. There was an article on World Net Daily a couple of weeks ago that said that the treaty is all smoke and mirrors--the mullahs already have nuclear weapons and the treaty is simply designed to save Obama's face so it doesn't look like they got them during his term.